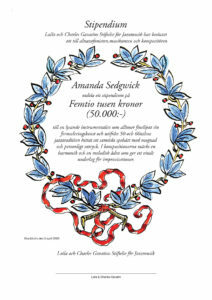 Altsaxofonisten, musikanten och kompositören Amanda Sedgwick tilldelades 2008 ett stipendium från Laila och Charles Gavatins Stiftelse för Jazzmusik med motiveringen: "Till en lysande instrumentalist som alltmer finslipat sin formuleringskonst och utifrån 50- och 60-talens jazztradition hittat ett samtida spelsätt med mognad och personligt uttryck. I kompositionerna märks en harmonik och en melodisk ådra som ger ett vitalt underlag för improvisationer". Amanda Sedgwick was born in Stockholm, Sweden. She completed her studies at the Royal College of Music in Stockholm in 1995. The next year she was selected to record "Jazz in Sweden", an annual series of recordings of young Swedish jazz artists issued by The Swedish Concert Institute. This album, titled "Volt", features Amanda's composing and arranging for an extended ensemble with strings and woodwind, and earned her very positive reviews as well as the award "Newcomer of the Year" by Swedish jazz critics and jazz radio. During the following years Amanda worked throughout Europe, playing both with many of Sweden's most renowned musicians (Bernt Rosengren, Nisse Sandström, Sture Nordin, Rolf Ericson) as well as such international musicians as Philip Harper, Walter Booker and Ingrid Jensen. Between 2001 and 2003 Amanda lived in Holland, where she also worked extensively, appearing at several Dutch festivals, and leading her quintet featuring Jarmo Hoogendijk on trumpet. Amanda Sedgwick continues to tour internationally, as well as teaching and composing music. In 2008 Amanda received a scholarship from Laila and Charles Gavatin's Foundation for Jazz Music.